Sage Valmiki, a contemporary of Lord Ram, mentioned in his magnum opus Ramayana that when Lord Ram was born, the sun was located in Aries,Saturn was in libra, Jupiter and the moon were shining in Cancer, Venus was seen in Pisces while Mars was in Capricorn. Moreover, It was the ninth day of the increasing phase of the moon in the lunar month of Chaitra. The two illustrations on the cover display, with the help of a powerful software, that these unique astral conditions were present in the sky on January 10,5114 BC. This path-breaking book employs the scientific advancement of the West to prove the antiquity of the East. 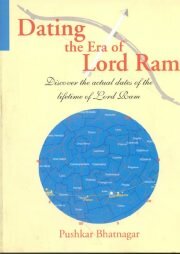 Not only the date of birth, the book also discovers the dates of a number of events in the life of Lord Ram by using the Planetarium software. 2. The basic concepts of observational astronomy. 3. A brief description of software used for dating. 4. The relevance of Valmiki Ramayana in astronomical dating. 5. The astronomical dating of the Ramayana: the date of birth of Lord Ram. 6. The astronomical dating of the Ramayana: the date of exile of Lord Ram. 7. The calendar during the times of the Ramayana: the calendar of today. 8. The astronomical dating of the Ramayana: the date of battle between Lord Ram and Khar - Dushan. 9. The date of the killing of Bali: a confirmation by a second solar eclipse. 10. The date of Hanuman meeting Sita: confirmation by a Lunar eclipse. 11. The astronomical dating of Ramayana: other dates of the fourteenth year of Lord Ram's exile. 12. Archaeological evidence to support the findings. 13. The dating of Ramayana: Mahabharata War and the beginning of Kali Yuga. 14. Astronomical dating: explanation of some related issues. Bibliographic Information: x,102p.+59 Col Zodiac Signs & Planets Biblio, Gloss. I had talked with Mr. Bhatnagar about 10 years back when he ..